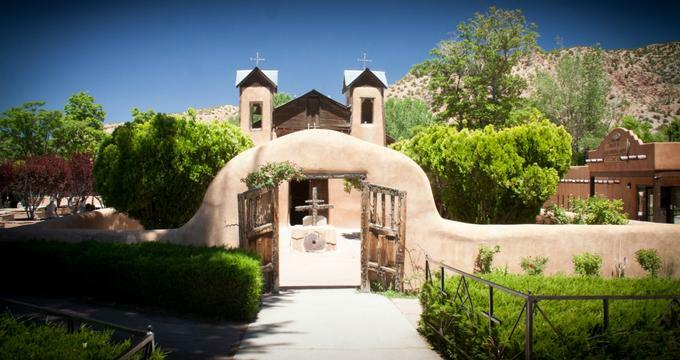 The El Santuario de Chimayo Historic Site is managed by the Sons of the Holy Family, and is part of a compound that consists of two historically significant buildings. El Santuario de Chimayo is a small shrine that was constructed on the location of what is believed by many to have been a miracle related to the crucifix of "Nuestro Señor de Esquipulas," or "Our Lord of Esquipulas." The shrine is also the site of the small hole of Holy Dirt, or "el pocito," which many people believe possesses astounding curative powers. The legend is that the Santuario de Chimayo, or also known as the Santuario de Nuestro Señor de Esquipulas, was constructed after a local friar saw a strange light coming from a hillside close to the Santa Cruz River while performing penances. Out of curiosity, the friar looked for the light's source. He dropped to his knees and began to dig in the soil with his hands and found a crucifix, which he later christened Nuestro Señor de Esquipulas. The crucifix was taken to the neighboring village three times in procession, and somehow disappeared all three times. Each time it disappeared, it was later found back on the hillside in the hole of dirt in which it was originally found. It was decided that Nuestro Señor de Esquipula desired to stay in the village of Chimayo, so the people built a small shrine on top of the hole where the crucifix was discovered. Miraculous healings began soon after the small chapel's construction, and the original chapel was replaced by the present-day Santuario by 1816. People began to attribute the healings in Chimayo over the years to the sandy soil in which the crucifix was found, rather than the crucifix itself. The "blessed earth" or "tierra bendita" was made into a paste to put on afflicted parts of the body, dissolved into water to drink, or eaten. This hole, or "el pocito," can still be seen today at the El Santuario de Chimayo Historic Site. Almost every visitor to El Santuario de Chimayo Historic Site visit the small, candle-lit room. Within a short walking distance from El Santuario de Chimayo is the other building contained within the compound, the Shrine of Santa Niño de Atocha. This shrine was first constructed in 1856, and is the site of what is a growing and strong tradition now spanning across several generations. The shrine has been an Easter pilgrimage for many people. It first started with the sailors and soldiers of the United States who came to the shrine to pray to the Santo Niño during the Bataan Death March. After returning to the United States, these servicemen began their pilgrimage to Chimayo, the site of a number of Santa Niño, to give their thanks for their return to America, as well as in memory of the suffering that occurred. This tradition now encompasses several thousand people of all walks of life and all faiths.